If you believe the revelation Jesus has given of Himself in the Scriptures, then the decision to obey Him is the only logical conclusion you can make. If you do not know Jesus, or you doubt the truth of His revelation, or if you have been mislead about Him, then it may not make much sense to you to forsake your own way and to trust and obey the Lord. It is sad enough that many people do not obey Jesus’ command to enter the narrow gate because they are ignorant of it. They have not yet heard a clear presentation of the gospel message. They are lost in the various false religions or vain philosophies. We have a responsibility to tell them so that they can believe and follow Christ. However, it is even more sad that there are also many people that have heard of Jesus, but what they have heard about Him and His message has been distorted by false teachers. These people think that they have entered the narrow gate and are following the way of the Lord, but in reality they have been deceived. We have a responsibility to warn them as Jesus did. The Warning – Matthew 7:15-20. Jesus is warning of one of the greatest threats to human welfare, yet it is a warning to which the vast majority of people will not give consideration even if they read this passage. Most people consider things such as the economy, personal finance, health, safety, politics and social values to be of much greater importance. Even though each of these can affect us for only a relatively brief time at most, people give more consideration to them because they are what affects them in the present here and now. For example, the economy, and in particular your personal finances, affect your standard of living, but however high or low that standard of living, the fact is that your life here on this earth is but a “vapor” as described in Ecclesiastes 1. We would all like to be comfortable and happy in this life, but a more important question is will you find comfort and happiness when you face death? The goal of life should be preparation for eternity. Another example is government. A good government can make life a lot more pleasant and a bad government can make it a lot more miserable. 1 Timothy 2:1-2 commands us to pray for those in authority over us. In view of the representative form of government we have here in the United States, I also believe each citizen has a responsibility to be involved in the political process to help determine whether we have a good or bad government. Yet, we must also understand that a government can only affect us outwardly. Even a terrible government that persecutes Christians cannot force an internal change in the believer. Society may crumble around you and make it more challenging to live a holy and pure life, but other people cannot stop the work Christ has begun in you (Philippians 1:6). These things are outward and will affect how you live, but they cannot affect who you are. In this passage, Jesus warns us about those who can affect you internally by presenting falsehood in the garb of truth and getting you to believe and follow their lies. The greatest danger you face is what will affect you internally and determine your eternal destiny. In a similar manner, the greatest danger and challenge to the church is not finances, government or social decline. History has shown that the church actually does best when troubled and persecuted because it then becomes more dependent on God, and those that are not serious about following Christ are less inclined to join it. Even so, in good times or hard times, the greatest danger to those that would follow God are false prophets who teach people to trust and follow someone or something other than Jesus Christ. Jesus warning here about false prophets is not something new in the Scriptures. God has continually given warning about those that would come and present lies and falsehoods as truth. These false prophets did come and they led many people astray because the people failed to heed God’s commands and warnings. The truth of the matter was that the people did not want to hear the truth. God said of them in Isaiah 30:9-11, “For this is a rebellious people, false sons. Sons who refuse to listen to the instruction of the LORD; Who say to the seers, ‘You must not see visions’; And to the prophets, ‘You must not prophesy to us what is right. Speak to us pleasant words. Prophesy illusions. Get out of the way, turn aside from the path. Let us hear no more about the Holy One of Israel.’” The dreadful response by the religious leaders was that they listened to the people. God rebukes them in Jeremiah 5:30-31, “An appalling and horrible thing has happened in the land: The prophets prophesy falsely, and the priests rule on their own authority; and My people love it so!” Jeremiah warned the people in chapter 23 to stop listening to these self proclaimed prophets because they spoke of visions from their own imaginations and prophesied, but it was not from the LORD. The things these false prophets said were not true and the things they foretold did not come about. They should have been stoned, but the people were far from God and instead they listened to and followed the lies. The eventual outcome of all of it was the captivity of both Israel and Judah. This was in the Old Testament, but the same theme of warning about false prophets continues throughout the New Testament. Jesus’ gives warning here in Matthew 7 and in also Matthew 24. The apostle Peter warned in 2 Peter 2:1, “But false prophets also arose among the people. Just as there will also be false teachers among you, who will secretly introduce destructive heresies, even denying the Master who bought them, bringing swift destruction upon themselves”. The Apostle John warned about them in all three of his epistles. Paul gives warnings in most of his epistles with 2 Timothy 4:3 even telling us that part of the reason for the rise of these false prophets and teachers is because the people “will not endure sound doctrine; but wanting to have their ears tickled, they will accumulate for themselves teachers in accordance to their own desires; and will turn away their ears from the truth, and will turn aside to myths.” That is the same thing Isaiah and Jeremiah described. False prophets will come and there will be plenty of people who will rejoice in their coming because they want to hear the pleasant words that tickle their ears. They cannot endure the truth. False prophets claim to be something they are not. They also claim to speak for the Lord, but they do not. Their false identity is always eventually revealed because what they say does not match the truth, and what they predict does not happen. But there is another kind of false prophet that is more deceiving because they wield demonic power. In Matthew 24:24 Jesus says, “For false Christs and false prophets will arise and will show great signs and wonders, so as to mislead, if possible, even the elect.” 2 Thessalonians 2:9 specifically points out that this activity is in “accord with Satan.” How do you discern that someone is a false prophet when they perform these kinds of demonically empowered signs and wonders? There are two ways to determine whether a prophet is true or false. The first we have already seen in Deuteronomy 18 and that is 100% accuracy in the prophecy that is claimed to be from God. If they are in error in anything they predict, then they are false. Even those who have demonic power will fail eventually because even though Satan is powerful and can do supernatural things we consider amazing, he does not control the future. Only God knows and controls the future able to declare the end from the beginning (Isaiah 46:10). Moses gave warning of a second kind of false prophet in Deuteronomy 13:1-3, “If a prophet or a dreamer of dreams arises among you and gives you a sign or a wonder, and the sign or the wonder comes true, concerning which he spoke to you, saying, ‘Let us go after other gods (whom you have not known) and let us serve them,’ you shall not listen to the words of that prophet or that dreamer of dreams; for the Lord your God is testing you to find out if you love the Lord your God with all your heart and with all your soul. You shall follow the Lord your God and fear Him; and you shall keep His commandments, listen to His voice, serve Him, and cling to Him. But that prophet or that dreamer of dreams shall be put to death, because he has counseled rebellion against the Lord your God who brought you from the land of Egypt and redeemed you from the house of slavery, to seduce you from the way which the Lord your God commanded you to walk. So you shall purge the evil from among you.” The passage goes on to say that anyone who tries to entice you away from following the Lord God, even if it were your friend, brother, son, daughter or wife that you cherish, that person should be put to death. We should never be impressed by someone just because they can do amazing things. The proof that a person represents God is not in signs and wonders which appear to be supernatural. What demonstrates they are actually from God is twofold. 1) They are 100% accurate when they say they speak from God, and 2) They lead people into worship of the true God. This demands that they agree with what God has already revealed about Himself otherwise they are directing worship to a false God. People may claim anything they want, but truth is always determined by God’s standards, not man’s gullibility. As we shall see next week, if you do not meet God’s standards, even sincerity is worthless. There are those that are so self-deceived that they claim to do miraculous things on behalf of the Lord, yet the truth is that Jesus does not even know them and so He will tell them to depart for they are actually workers of lawlessness. The warning that Jesus is giving in this passage is a serious matter. The Old Testament tells us that false prophets deceived people in history, and the New Testament tells us that we face the same danger, so beware, take heed, be careful of, watch out for false prophets. Now look at the next two phrases in Matthew 7:15. “Beware of the false prophets, who come to you in sheep’s clothing, but inwardly are ravenous wolves.” These false prophets that Jesus is warning us about are not easily spotted. He commands us to “beware.” This is from prose;cw / prosecho, “to be in a continuous state of readiness to learn of any future danger . . . and to respond appropriately” (Louw Nida). You must be on guard to carefully examine them in order to identify them. Everyone would agree that it is easy to spot someone who is advocating a non-Christian religion. You can easily spot the Buddhist, the pagan, the idol worshiper, the atheist, the secularist, the Hindu and the Muslim by what they say and often even by how they dress. But it can be very difficult to identify the false prophet when they use the Bible in their teaching and claim to worship the God we worship. They do not appear to be enemies of the flock, but rather as a friend. There is some difference of opinion as to what it means that they come in “sheep’s clothing.” Some say it means they come looking like a sheep. This would be the proverbial wolf in a sheep’s skin. But the more I have looked at this the more I believe this reference is not that they come looking like one of the other sheep, but that they come looking like the shepherd. They come appearing as the one that is supposed to be the protector of the flock. My reasons for understanding the passage in this way is simple. First, the text says “sheep’s clothing,” not “sheep’s skin.” The word, “clothing” here (e]nduma / enduma) refers not to an animal skin, but a garment made from some fiber, and in this case it is that of a sheep – wool. The same word is used in Matthew 3:4 to describe John the Baptist having a garment (an outer robe) made of camel’s hair. It was not camel skin, but the hair of the animal woven into a garment. That brings up the second reason. A person’s trade was often identified by what the person wore, and the prophets often wore rough, hairy garments as did John the Baptist. False prophets would put on such clothing in order to look like the true prophets. Zechariah 13:4 talks about such false prophets who “put on a hairy robe in order to deceive.” Shepherd’s wore clothing made from sheep’s wool, and a false shepherd would wear similar clothing in order to look like the true shepherd. Paul’s comment in 2 Corinthians 11:13-15 gives us some insight into this. “For such men are false apostles, deceitful wonders, disguising themselves as apostles of Christ. And no wonder, for even Satan disguises himself an angel of light. Therefore it is not surprising if his servants also disguise themselves as servants of righteousness; whose end shall be according to their deeds.” The false prophet does not come to be part of the flock as sheep, but to lead the flock as a shepherd. That is why they are so dangerous. False prophets may look like shepherds, but inside they are ravenous wolves. Their goal is not feed the sheep, but to feed off the sheep. It is interesting to note that the word ravenous here (a’rpax / harpax) is translated as “swindler” or “extortioner” every other time it appears in the New Testament. Peter said of false teachers in 2 Peter 2:3 that “in their greed they will exploit you with false words . . .”. They will take advantage of the sheep to get out of them what they want to fulfill their own desires. Their concern is themselves, not that of the sheep. It may be money; it may be a sense of power and control; it may be fame or a combination of all, but the bottom line is their own self gratification. They may talk about Jesus and the scriptures and how wonderful it is to be a Christian, but ultimately, it is their own kingdom they are working for, not the kingdom of God. Some false prophets are not very well hidden and can be spotted fairly easily if a little time is taken to inspect what they believe. For example, The Church of Jesus Christ of Latter Day Saints, also called the Mormons, quickly demonstrates its true nature once its doctrines are examined and you find out that they teach that Jesus & Lucifer (Satan) are brothers, the sons of a God named Elohim. Jesus is a glorified, exalted human who attained godhood. The goal of Mormonism is to reach the same state and become gods that will rule over their own planet. Christian Science, founded by Mary Baker Glover Patterson Eddy, and based on her book, Science and Health with Key to the Scriptures, among other heresies, denies the following doctrines: the deity of Jesus Christ; The physical death of Jesus Christ; The existence of the Holy Spirit and Satan; and Salvation by substitutionary atonement. Sun Myung Moon’s Unification Church, also known as Moonies, has spent millions of dollars trying to win acceptance as a Christian religion. Those efforts have failed and they remain a recognized cult group because of they deny the physical life, death and resurrection of Jesus Christ as well as their teaching that salvation is found in following Moon’s Divine Principle rather than in Jesus Christ. The Watchtower Bible and Tract Society, more popularly known as Jehovah’s Witnesses is based here in New York. While they consider themselves to be the only true Christians and that only they can interpret the Bible, they are in fact a heretical cult that denies many essential doctrines of the Christian faith including: The triune nature of the Godhead; the deity of Jesus claiming He is a created being; salvation from sin by God’s grace through faith alone; the reality of eternal Hell. They also have had a long history of false prophecies predicting the end of the world in 1914, 1918, 1925, 1975 and 1989. There are, of course, many other cult groups that claim to be Christian but are founded on something other than the Bible being the source of authority. Many have been openly identified such as Armstrongism, Branhanism, Christadelphians, Freemasonry, The Way International, The Family or The Children of God, The Local Church, Oneness Pentacostalism, Unitarianism, the Word-Faith Movement and many, many others. Some are well known and some are not. Each of these is dangerous, but because they have been identified, they are easier to recognize and warn others about them. Resources such as http://www.apologeticsindex.org/ , and http://www.watchman.org/ are helpful in identifying them. The various cults are bad, but more perilous are the false prophets that claim to be following orthodox Christianity. They speak favorably of Jesus Christ, the Bible, the Cross, the Holy Spirit, etc. They associate with true believers and may go out of their way to appear evangelical with their appearance and vocabulary sounding genuine, yet they are fakes. They are not orthodox. They are wolves clothed as a shepherd. If you listen carefully with discernment you will be able to recognize them, but it is not always easy. Many who profess to be Christians are enamored with people such as Benny Hinn and Kenneth Copeland and so many others in the Charismatic world without recognizing they are heretical. The same is true of Rob Bell, Brian McClaren and others of the Emerging Church movement. Joel Osteen may have one of the largest if not the largest “church” in the United States, but that does not make him orthodox. 2 Peter 2:1 warns that “there will also be false teachers among you” and “Christian” radio and television are filled them. “Christian” book stores are filled with the writings of those who are false. Earlier this year I pointed out that Sarah Young’s book, “Jesus Calling,” is extremely popular, yet her Jesus is not the Biblical one. False teachers that gain popularity also get exposure that eventually leads to proper critique that identifies them as wolves. However, there are many more that do not gain such exposure. They are members of evangelical churches, missions agencies and Bible schools with which we would easily associate, and they are teaching children or youth, or serving as a board member, pastor, Bible educator or missionary. These false teachers are rarely caught for they sound very Biblical, freely quoting the Bible, and their arguments often sound very logical. Remember that the context of the Sermon on the Mount is an exposure of the true nature of the Scribes and Pharisees. These were the religious leaders of the day. They were considered to be the supreme examples of godliness, yet they were false. How then can such false teachers be identified? What fruits? There has been much spilt ink on this subject, but the answer is not difficult if we remember the context. The immediate context is the narrow and wide gates mentioned in verses 13-14. There are true prophets who are calling us to enter the narrow gate that leads to the narrow path that leads to life. But there are also many false prophets along the wide gate that leads to the broad way that leads to destruction. Many are themselves deceived and with all sincerity believe they are telling the truth. They call out, “Jesus went this way,” “Paul went this way,” “eternal life is this way,” but they are wrong, and those that heed their call will enter onto the path that leads to eternal destruction. The broader context is that of judgment which was introduced at the beginning of Matthew 7. We are not to be censorious, condemning judges as were the Scribes and Pharisees, yet we are to be discerning and make wise analysis of what is occurring in the lives of others and respond appropriately. (See: Judging Righteously) One area of discernment is to beware of false prophets, and that requires judgment on our part to identify them. Recall as well that the context of the whole sermon is the nature of true righteousness from the heart as compared to self righteousness as seen in the Scribes and Pharisees. For what fruit then are we to be looking? Righteousness which is produced by the good tree as compared to unrighteousness and self-righteousness which is produced by the bad tree, thorns and thistles. Do their lives display the qualities Jesus has described in this sermon? Does their character match the Beatitudes of being poor in spirit, mournful, meek, hungering and thirsting after righteousness, merciful, pure in heart, and being a Biblical peacemaker? How do they respond to persecution and suffering? Are they salt and light to the world? 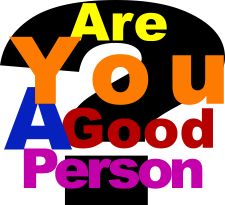 Do they view themselves as good because they have not broken a list of rules and regulations, or are they of humble heart striving to do good and truly love God and others including their enemies? Do they have integrity and live honorably? Do their religious practices draw attention to themselves or give glory to God? Are they anxious about the things of this world because their true master is mammon, or are they at peace trusting in God to provide as they seek first His kingdom and His righteousness? Are they quick to condemn others that do not meet their personal standards, or are they humble in their approach to brothers who are in sin and strive to help them live for Christ? False prophets? They are all around. When you meet someone or hear them on the radio or see them on TV and they claim to speak for God, then you must test them. If they prophesy the future, they must be 100% accurate or they are proven are false. Flee from them. If they promote any other God than the Triune Creator God of Scripture, then they are false. Flee from them. If they are not in agreement with what God has revealed about Himself in Scripture, then they are false. Flee from them. This does not mean there cannot be legitimate differences in minor points, but they must hold to and teach the major Biblical doctrines such as the Triunity of God, the deity and humanity of Jesus Christ, the reality of the Holy Spirit as a person, and the substitutionary atonement by the sacrifice of Jesus Christ at Calvary. God’s holiness and justice must be presented as well as His love and mercy. Finally, they must be living according to the righteous described in the Sermon on the Mount. That does not mean that they are perfect and without sin. It does mean that when they do sin, there is the true repentance of a person who is poor in spirit and hungering and thirsting after righteousness. If these things do not mark their lives, then they are false regardless of whatever else they may say. Flee from them. They are wolves dressed in sheep’s clothing in an attempt to imitate the shepherd. Beware of false prophets. You will know them by their fruits. Do they display the ___________________qualities described in the Beatitudes? Are they salt and __________to the world? Do they draw attention to themselves or bring glory to God? Is ____________their master and anxious about worldly things or are they at peace trusting God to provide? Are they condemning of those that do not meet their standards or ____________to those caught in sin? If they fail these tests, they are false teachers, wolves imitating the shepherd – _____________! Parents, you are responsible to apply God’s Word to your children’s lives. Here is some help. Young Children – draw a picture about something you hear during the sermon. Explain your picture(s) to your parents at lunch. Older Children – Do one or more of the following: 1) Write down all the verses mentioned in the sermon. You can look them up later. 2) Count how many times the term “False prophet” is used in the sermon. Talk with your parents about who false prophets are and what they teach. Questions to consider in discussing the sermon with others. Are you on the narrow path or the wide path (Matt. 7:13-14)? What is the greatest threat to your welfare? Why? What is the greatest threat to the church? Why? Explain the warning God gives in Deut. 18:20-22. Does that warning apply in our time? Who follows false prophets? What is the source of power for some false prophets to perform “miracles”? What two tests can you use to find out if someone is a false prophet? Why does God allow false prophets (see Dt. 13:1-3)? What doctrines are so crucial that error in them would result in being a false prophet/teacher? What does it mean that they wear “sheep’s clothing”? Why are they called “ravenous wolves”? What are some cults that you are aware of? Why do you know they are false? Where do the most dangerous false prophets teach? Why are they so dangerous? What is their major and fatal error? What are the “fruits” by which Jesus says we will know them? How does the context help you determine this? Are you being influenced by any false teachers (books, radio, TV, internet)? What should you do?